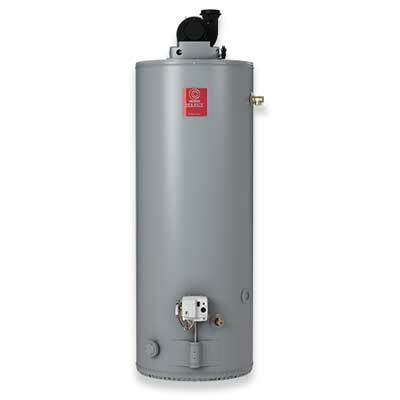 The Select® Power Vent gas water heater is engineered to maximize efficiency&apos; while offering greater flexibility in installation options. Three position rotatable blower outlet Our exclusive 3-position rotatable blower outlet adds flexibility for an easy installation. Coregard Anode Rod Our anode rods have a stainless steel core that extends the life of the anode rod allowing superior tank protection far longer than standard anode rods. Brass Drain Valve Solid brass&apos; tamper resistant&apos; enhanced-flow&apos; ball type&apos; valve. Self cleaning dip tube Reduces lime and sediment buildup and maximizes hot water output. Made from long-lasting PEX cross-linked polymer.